What's great about Smashwords is that it distributes an author's book to many different retailers such as Barnes and Noble and Apple ibook, etc. The book has always been available for Kindle on Amazon, but now it's available in many other formats. You can also download a sample to check it out. Imagine for a moment living in a world with no war, no anger, no judgment, no fighting. The words of John Lennon’s song come to mind…. 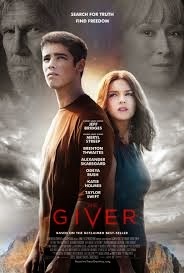 It’s certainly a nice sentiment, but the movie The Giver , based on the 1993 novel by Lois Lowry, shows us what such a world might look like: a world of ‘sameness.’ Director Phillip Noyce does a great job of using black and white to paint a picture of a peaceful and complacent world. We’ve seen it before when director Gary Ross used it in Pleasantville, and it certainly served this movie as well. This post-apocalyptic ‘utopian’ world came about after something referred to as ‘The Ruin’. Everything that could possibly cause upset has been removed, including the ability to see color and feel emotions. Even weather is controlled…no snow or storms allowed. There are no automobiles so no worry of road rage or accidents. Each person receives a daily dose of medication that depresses all of their feelings, even those of love, longing and joy. ‘Precision of Language’ is a commonly used phrase to make sure communication stays clear. I have to say that could come in handy in relationships sometimes. If someone says they are angry…what is the precision of that word….anxious, nervous, insecure? However, ‘warm and nice’ just don’t say enough when it comes to love, but the people in this world wouldn’t know, they don’t feel those emotions. Also missing are memories. All of the community’s memories of life before this contrived community are stored with one person called The Giver (Jeff Bridges) who gives the elders guidance based on the decisions of the past. Every 10 years a new Receiver is chosen to receive all of the memories. Young Jonas (Brenton Thwaite) is chosen to be this Receiver….and soon thereafter sameness is in jeopardy. Jonas stops taking the daily medication, and begins to see colors and feel emotions and soon realizes what he and the others in his world have been denied. Meryl Streep does a formidable job of playing the Chief Elder and pops up in holographic form to keep the community in line. Katie Holmes and Alexander Skarsgard play the Family Unit ‘parents’ assigned to Jonas and are successful in keeping an emotionless presence throughout the film. 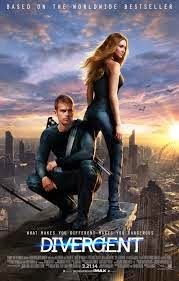 I enjoyed the film, although not as much as similar films on this subject: Divergent and Hunger Game. My main issue with this film is that they could have made it a little longer and done a little more with the memories being ‘given’ to Jonas. They seem too brief and choppy, and certainly don’t serve to elicit any emotion from the audience. While I love the sentiment of John Lennon’s song, and it’s certainly something to strive towards…The Giver reminds us that a utopian world with only harmony comes at too great a cost. In my new book Reel Transformation: Your Life Now Playing I talk about the Five Stages of Transformation that all of us go through. These stages can be found in any good story where the main character grows and changes. We find them in the Bible, in fiction, and in movies of all genres. Joseph Campbell wrote about these stages in his book The Hero’s Journey. He wrote about 12 Stages, and from those I have extracted five stages that we go through over and over again in our life if we are open to change and growth. In any story, movie or life in order to see any evidence of change we must have a clear understanding of the before and after…the beginning and the end. The beginning of every story originates in what Joseph Campbell calls the Ordinary World. 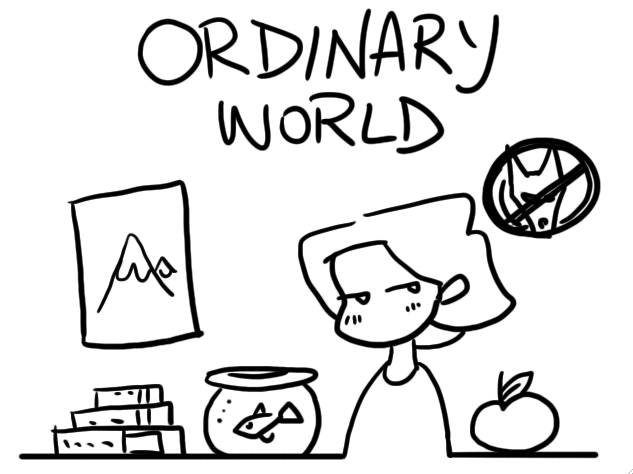 All of us start out in our Ordinary World. It might be a physical place, but it also includes our frame of mind, our beliefs and our habits. Even once we’ve gone through all five stages and return home…that new home becomes our Ordinary World that we will eventually get called out of again if we are to continue growing and evolving. Our Ordinary World is our comfort zone. It is what feels familiar. Often we are so comfortable that we are reluctant to leave or change, even if we are unhappy. Yet there will be a Call that comes to invite us to venture out of the Land of Familiar to explore new possibilities. An example we see in the Wizard of Oz is Dorothy in the black and white world of Kansas. She lives with her aunt and uncle and her dog Toto. This is her familiar world, but she is not happy there. She experiences challenges and feels a tug of Divine Discontent when she wonders what life would be like somewhere else…over the rainbow. Your Ordinary World could be your job, your family situation or even some beliefs that you have been comfortable holding that perhaps don’t serve you anymore. For example, if you’ve been feeling a tug to quit smoking, your Ordinary World is that of a smoker. If you are a young adult living at home with your parents, then that is your Ordinary World. At some point you will be called to leave that world. It’s not bad where you are, but we are always called to grow and that usually requires we leave what feels ordinary and comfortable to embrace something new. Some more examples from movies: Neo (Matrix) in his world as a computer programmer, Luke (Star Wars) living with his aunt and uncle, Katniss (Hunger Games) struggling for food in District 12, Marlin (Finding Nemo) living in fear in his corner of the ocean. EXERCISE: Getting in touch with your Ordinary World. Think about the world in which you live at present. What are your physical surroundings? Where do you live and work? What beliefs are you holding? What daily habits have gotten all too familiar? There is nothing wrong with where you are now. Now think about where you’ve been? How have you changed and how has your ordinary life changed? You are not the same person you were 10 years ago, or 5 years ago and maybe even 1 year ago. What has changed? How have you changed? Our Ordinary World changes many times over a lifetime. Watch for a post to follow where we will explore THE CALL to leave our Ordinary World and explore new adventures. If you are interested in reading more about these stages you can find Reel Transformation: Your Life Now Playing at: https://www.createspace.com/4814039 and on Amazon. 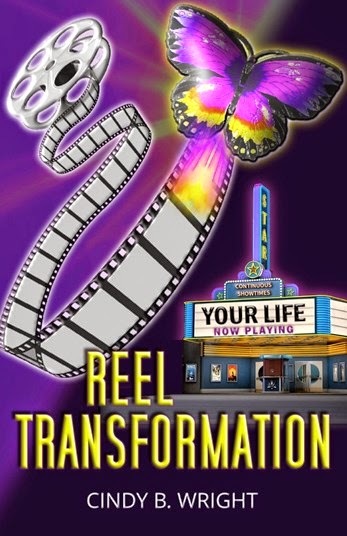 My book Reel Transformation: Your Life Now Playing is now available for sale at either Createspace or Amazon. It's available in paperback or Kindle. This book has been a long time coming and seeing it out in print is a dream come true. "I just finished your book. It was fantastic. It was just what I needed to hear at this time in my life to reawaken my spiritual understanding." 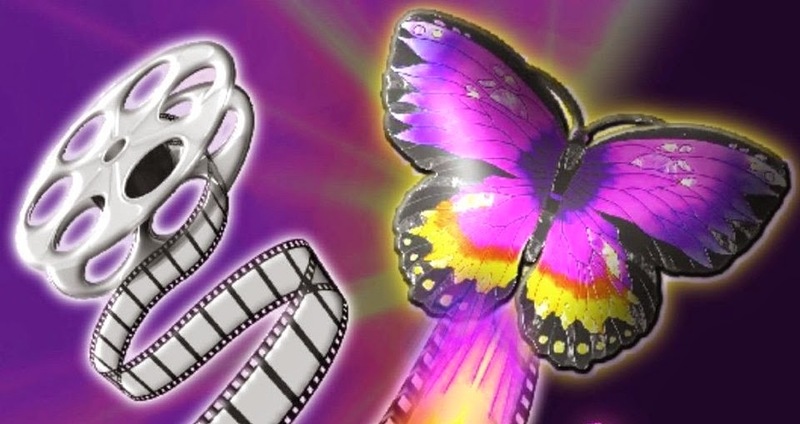 Reel Transformation shows you how to use something you love—watching movies—to assist you in your own growth and transformation. From the beginning of time stories have been told to convey some deeper meaning. Jesus used parables to teach, and movies have become our modern day parables. In the parable of the Prodigal Son we find five stages of the transformational Hero’s Journey: 1) Home in the Ordinary World, 2) The Call, 3) The Wilderness, 4) The Awakening, and 5) The Return Home. We find these stages again and again in movies of all genres. After reading Reel Transformation you will be able to watch movies with intention and recognize your life now playing in the characters you see on the screen. The next time you go to the movies get something more than popcorn; get transformed! You can click on the image in the right column of this blog to take you directly to Createspace if you'd like to purchase the paperback. Or you can go to Amazon.com to find the Kindle. 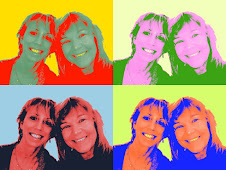 I hope you will buy the book....and in the meantime, I'll see you at the movies! I was eager to see Richard Linklater’s new film Boyhood. I enjoyed his “Before” trilogy: Before Sunrise, Before Sunset, and Before Midnight, and how he showed us the same characters across a span of time. This time he wrote and produced an innovative movie about ‘ordinary moments’ in a coming-of-age film. Even though it’s called Boyhood the movie is really about the evolution and growing up of each of the characters in the family, including the parents. It was a risky decision to film a movie over 12 years with the same actors. Any number of things could have happened to halt the production of this film and Linklater is to be credited with taking on this creative risk, which totally paid off. Mason Jr. (Ellar Coltrane) is about six years old when the film begins. He lives with his sister Samantha (Lorelei Linklater) and his mother (Patricia Arquette), a single mom who is divorced from his dad Mason Sr. (Ethan Hawke). The movie moves seamlessly through the 12 years. We notice the passing of time through changes in hairstyles, music and cultural events as well as the subtle aging of the characters. We watch Mason grow and mature from a child of six to a young man entering college, and we see young Ellar grow up into a great actor as well. His sister, played by Linklater’s daughter grows up and blossoms into a young woman. We get to see Mason’s mother evolve from a woman who keeps choosing alcoholic husbands to finally going back to college and finding her place in the world. Probably the most evident maturation, though, is seen in the adolescent, mostly absent father who, in the beginning of the film, would rather be a ‘pal’ than a father to his kids. Mason Sr. by the end of the film has settled down, gotten married and had another child. This is not an action-filled movie, and yet I was so engrossed in the ‘ordinary moments’ that I hardly noticed that 164 minutes had passed. Yes, I’ve said this film is about ‘ordinary moments’, but this is no ordinary film. This is an extraordinary, one of kind film of a lifetime. Don’t miss it! 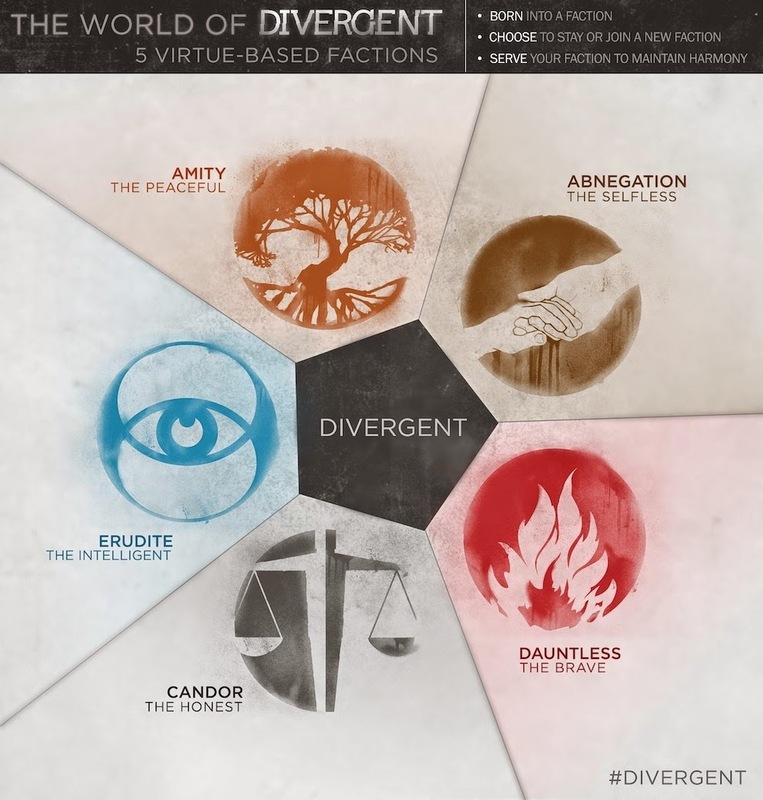 DIVERGENT: Faction, Factionless or Divergent? Unlike The Hunger Games, I went into the film Divergent with no knowledge or expectations. I had not read the books or even heard about them before watching the movie. I love films that bring up interesting questions and make me think, and this one did not disappoint. In fact, I was so intrigued that I rushed to get the first book in the trilogy … finished it in no time and quickly read the remaining books. Divergent takes place in a future Chicago 100 years after an apocalyptic war. The city is fenced off from the rest of the world, and when the Great Peace was established society was separated into five different factions each one dedicated to the cultivation of a particular virtue: Candor (honesty), Abnegation (selflessness), Erudite (intelligence), Amity (kindness) and Dauntless (bravery). The factions were formed in a belief that this could keep the peace. The Candor thought dishonesty caused conflict, the Abnegation, selfishness, the Erudite, stupidity, Amity believed being unkind led to the war and Dauntless believed bravery would keep war at bay. Once a year all the 16 year olds are given a test that determines which faction they belong. They then attend a Choosing Ceremony where they are given a choice: stay with their family and faction of birth or choose a different faction. Beatrice (Tris) Prior belongs to the Abnegation faction and her tests were ‘inconclusive,’ which she discovers means she is Divergent. People who are Divergent score high in multiple factions, and they are feared by many who want to eliminate them. The government is run by the Abnegation, who being selfless have no desire for power. While this sounds appealing…who wouldn’t want politicians who are selfless and not after their own gain or power, it also seems a bit confusing. Wouldn’t selfless also include kindness? And why would they not also be truthful? We have lots of politicians who aren’t truthful and we know how dysfunctional that can be. I can’t imagine anyone who is selfless being deceitful unless doing so would somehow benefit the other. I can understand why they might not be dauntless or brave or even intelligent. Another element of the movie that I found very compelling was the tests that each faction had to endure to qualify for their particular faction. For the Dauntless it was facing your fears. I think all of us could benefit by facing our fears to some extent. What I found incredulous was that the character Four had only four fears. Wow! I’d like to think I don’t have many fears, but I suspect there are a bunch of them hidden in my consciousness. I’m not sure I’d want to have to face them in a simulation, but I imagine it could be pretty powerful. Some of my fears I’m sure are hidden, and some poke their heads up on an almost daily basis. While I have many of the common ones like the fear of spiders and snakes, I also have a very unhealthy and unnerving fear of developing Alzheimer’s. I’m not sure why I have that fear, but I’d love to fight it in a simulation and crush it once and for all. Whenever it pops its head I simply do a ‘denial’ and an ‘affirmation’ to send it on its way…but fighting it in a duel and winning sounds pretty empowering. I’ve read the other two books and I know what happens with the whole society and the Factions and the Divergents. I won’t spoil it here for those of you waiting to watch the movies. But I will say this….if you liked Divergent, you will love continuing with the story. I can’t wait to write about Insurgent when it comes out in March of next year. 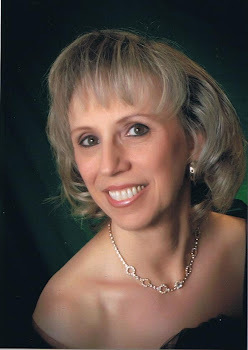 I am getting my book Reel Transformation: Your Life Now Playing ready for publication and I am over the moon excited! I had the idea for this book over a decade ago. I started noticing a pattern in many movies. It seemed many of the protagonists would leave home…either physically or metaphorically and then go through lots of challenges that I call wilderness experiences. At some point they go through an awakening and return home transformed. It is the quintessential Hero’s Journey. Inspired by Moody and Carroll’s book The Five Stages of the Soul, I condensed the stages of Joseph Campbell’s Hero’s Journey to the Five Stages of Transformation: 1) Home in the Ordinary World, 2) The Call, 3) The Wilderness, 4) The Awakening and the 5) Return Home. We see this Hero’s Journey in films of all genres. Films like The Wizard of Oz, The Lion King, Harry Potter and Star Wars. George Lucas wrote Star Wars deliberately using the template of Joseph Campbell’s Hero’s Journey, but many other film makers simply set out to create a good story and end up using this template unwittingly. It is easy to see this journey in adventure films, yet it can be found in comedies, animated films, romance and science fiction as well. The story that came to my mind as a minister was of the Prodigal Son. Compare this parable to the classic film The Wizard of Oz. The Prodigal Son felt dissatisfied with his life at home and demanded his inheritance. His loving and generous father gave it to him and the son left home. Dorothy was dissatisfied with her life on the farm in Kansas. She longed for a life over the rainbow and a tornado swept her to Oz. Both Dorothy and the Prodigal son felt a sense of dissatisfaction with their life and longed to be somewhere else. Dissatisfaction or ‘Divine Discontent’ is often what calls us out of our Ordinary World. The Prodigal Son ends up squandering his inheritance and finds himself cleaning the pig pens, homeless and without friends or a home. For a Jew who believed pigs to be the ultimate symbol of loathing this was truly a wilderness experience. While Dorothy had friends who helped her in Oz, she had numerous wilderness experiences. She was attacked by flying monkeys and had a wicked witch out to kill her. The Prodigal Son had an awakening when we ‘came to himself’ and realized that he was the son of a loving Father. He made the decision to go back and ask his father if he could be a servant in his home. Dorothy wanted to return home almost as soon as she arrived in Oz, and she needed to go through some life lessons so she could figure out that she’d always had the power to go home. Both the Prodigal Son and Dorothy return home transformed people. All of us go through these stages of transformation at some point in our life and usually we go through them over and over again. My book, using examples from movies, talks about these stages and shows you how to use something you love to do—watching movies—to assist you in your own growth and transformation. So keep an eye out on Amazon for Reel Transformation: Your Life Now Playing. Raymond "Ray" Kurzweil is an American author, scientist, inventor, and futurist who has said that by 2029 computers will have consciousness. Bill Gates has called Kurzweil the best predictor of the future, and it’s also been said that he has predicted the future with more accuracy than anyone else in history. A documentary called Transcendent Man: Prepare to Evolve came out in 2010 that shares the life and ideas of Ray Kurzweil. A new movie called Transcendence, starring Johnny Depp, Morgan Freeman and Rebecca Hall has brought Ray’s idea to the Hollywood screen. The main character is Dr. Will Caster (Depp) a leading scientist and researcher in the field of Artificial Intelligence. Like Ray, his life’s work has been centered on the idea of mastering the singularity, or as he calls it ‘transcendence’. We are introduced to PINN (Physically Independent Neural Network) who can identify someone who walks into the room and when asked ‘can you prove you are self-aware?’ counters with ‘can you prove you are self-aware?’ I tried asking SIRI that question and got ‘no comment’ and ‘I don’t really like these arbitrary questions’. Both PINN and SIRI dodged the question, although PINN’s answer was a bit more probing. While SIRI said she didn’t ‘like’ my question, she does not really experience emotions or even preferences. While creating an AI that exhibits emotions is the task Will set out to accomplish, I don’t believe he was successful. What he was successful at, with the help of his partner in life Evelyn (Rebecca Hall), was uploading his consciousness into PINN as his body was dying. While it certainly looked and sounded like the Will Caster we had briefly viewed at the beginning of the film, this cyber Will seemed devoid of all emotions. Once Will is connected to the Internet there is no stopping his power. While some of what he begins doing, like healing and restoring the sick and disabled, seems philanthropic, it begs the question: just because the power is available should it be used at all cost? Would you be happy you’d been healed if it changed who you were fundamentally without your choice or knowledge? Throughout this film I couldn’t help but think of Ray Kurzweil and his desire to recreate his father who died when he was a young man. Is Ray correct in saying that computers will have consciousness in my lifetime? It certainly seems possible, but I think we have a ways to go before we can make sure that this new evolutionary ‘being’ also has a conscience, a value system and a soul. It’s been a while since I’ve been able to write here, but I’m retiring from ministry this weekend, so I’m anticipating I will have much more time to dedicate to writing about what I love: Movies! It seems fitting that I’m retiring on the Sunday the Academy Awards will be shown. It will be a full day with church, my retirement party and then the Oscars in the evening, but I’m ready! I always make it a point to see every film nominated for Best Picture and as many others as I can manage. I am blessed to have married a wonderful man who also loves the movies and together we’ve seen all 9 nominated films. So here are my predictions for the top six Academy Awards. BEST PICTURE: I find it amazing that out of the nine films nominated five of them are based on a true story. I have to say that I was a bit disappointed that The Book Thief wasn’t included in any of the nominations. I found it an incredibly touching film that moved me at my core. Also, I missed out on seeing Inside Llewyn Davis so I can’t comment on whether or not that film should have been included. All of the films nominated were good for different reasons, but I believe the film that will win the prize will be 12 Years a Slave. American Hustle has received quite a bit of buzz, but I don’t think it will take home many, if any Oscars. 12 Years a Slave is a film that was extremely difficult to watch and left me feeling ashamed of my race, but it is totally deserving of Best Picture and seems to have the momentum. BEST DIRECTOR: It isn’t often that Best Picture and Best Director Awards are split, but I believe that will happen this year. Alfonso Cuaron deserves the statue for Gravity. The film was mesmerizing and left me asking myself ‘how’d they do that?’ This film will take home quite a few more Oscars. I predict Oscars for Gravity for Best Film Editing, Cinematography, Sound Editing, Sound Mixing and Visual Effects. BEST ACTOR: Chiwetel Ejiofor could possibly win for 12 Years a Slave, but I believe it will and should go to Matthew McConaughey. First of all, Hollywood often rewards actors/actresses who go to great physical extremes for their character, and McConaughey lost about 45 pounds for this role. As someone who is presently working on losing a few pounds, I admire his tenacity. He was also quite riveting and believable in the role. BEST ACTRESS: This one is tough. Meryl Streep was awesome in August: Osage County, but she’s already won 3 Academy Awards and most people think she’s won even more than that as she’s been nominated 18 times. There has been a lot of talk about Amy Adams, and while she was good, I don’t believe she will win. When I saw Sandra Bullock in Gravity I knew she would be nominated. It has to be difficult to act in a film basically alone and against a green screen much of the time. However, the actress whose has been raking in all the awards (very deservedly) is Cate Blanchett for her role in Blue Jasmine and I believe she will take home the Oscar as well. BEST SUPPORTING ACTOR: This one feels like a slam dunk. It will be Jared Leto from Dallas Buyer’s Club….no contest. All of the other actors were great. Barkhad Abdi in Captain Phillips, Michael Fessbender in 12 Years a Slave, Bradley Cooper in American Hustle and Jonah Hill of The Wolf of Wall Street are all great actors, they just picked the wrong year to compete. BEST SUPPORTING ACTRESS: I know there is a lot of buzz about Jennifer Lawrence in American Hustle and she just won last year, so there is some momentum for her to win two years in a row. There is also some sentiment for June Squibb to finally win an Oscar for her role in Nebraska. However, I believe the statue will go to Lupita Nyong’o for 12 Years a Slave. She has certainly won the hearts of the world with her heart-wrenching performance and I, for one, can’t wait to see what she wears on the Red Carpet. I did not see any of the films nominated for BEST ANIMATED FEATURE, although I intend to see Frozen soon and the word among critics seems to be predicting it to win. The Academy Awards is only a few days away and I’m looking forward to Ellen DeGeneres as host once again. My husband and I will each fill out our ballots and sit down in our living room on Sunday night to enjoy the show. I almost hope some of my predictions don’t come true as it seems like the Awards show has become way too predictable. I miss the days when strange and unpredictable things happened….like someone streaking out across the stage. Also, is it too much to ask for some interesting acceptance speeches…. forget the long list of people to thank and please tell us something unique and memorable! It won’t matter to me how late the show runs as I’ll be retired. Unfortunately my husband will have to get up early to walk the dog and go to work….ah well. Life is Sweet. See you at the movies!